Designers spend weeks and months prepping for a big fashion show. Putting together all of their best looks to showcase to the press, buyers, and the adoring public. But during a recent fashion show in India – it wasn’t the clothes that were the star of the show. Early on in the show, as models just started to strut down the stage, it seemed that they had a new model join them on stage – this one happened to be wearing a fur coat. 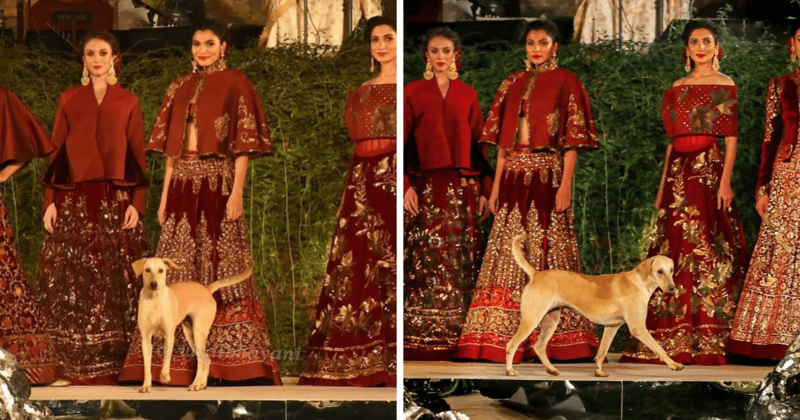 Designer Rohit Bal was showcasing their latest collection when a stray dog managed to make its way on the stage, completely stealing the show and everyone’s attention. Despite all of the sparkling sequins and bright colors – no one could take their eyes off the adorable, blonde dog and its hilariously sweet personality. Sohel Fidai, an entertainment journalist at the show, had his camera ready for the models that were making their way down the runway. He soon noticed that the dog had followed a model up the runway ramp and proceeded to strut its stuff! Video footage of the adorable party-crasher is below. Plus, another sweet animal that decided to make a fashion show appearance! Initially, the crowd was confused as to what was going on – and so were the models! They weren’t exactly sure what to do about the rogue model that just crashed the show. What’s even funnier is the fact that a famous Indian actor, Sidharth Malhotra, was supposed to take the stage as the start that night – he had no idea that someone else would take his place. Even though the agile dog managed to escape authorities when it entered the show – no one seemed to stop him once he was on stage and we couldn’t be more thankful for it. The models of the show didn’t seem too pleased about having runway competition, but the dog seemed as if he couldn’t be happier about it! The stray dog’s tail was wagging like crazy as he struts on stage – loving every minute the adoring crowd’s attention. Given the fact that the dog seemed comfortable on stage, not wanting to leave the platform, it was like this had always been a lifelong dream for the pup! Cameras captured the entire ordeal and the funny video has since gone viral – you can watch it below. But first – a reminder that this isn’t the first time an animal has crashed a fashion show! In 2018, at the Esmond International Fashion Show, a random cat seemed to take the term ‘catwalk’ a bit too literally. Once sneaking inside the building, the cheeky cat decided to make an appearance on stage as well! This party crasher, however, wanted to be the only one getting all of the attention and seemed to want to cop an attitude with any model that walked by or got a little too close. The entire audience was in stitches. You can watch the footage of the cat’s hysterical appearance below. We can’t help but be a little biased in thinking that the stray dog was certainly the star of the show last night. We’re sure the fashion models will have many more opportunities to showcase their skills down the runway, but for this dog? He took advantage of his one shot at stardom…and it worked! Watch the funny dog in action in the video below. Who was your favorite party crashed? The cat or the dog?